The day after my dad died I caught a plane from Durban back to Cape Town. As we were leaving my sister’s house she handed me a yellow canvas bag and asked me to give it to my brother, who also lives in Cape Town. 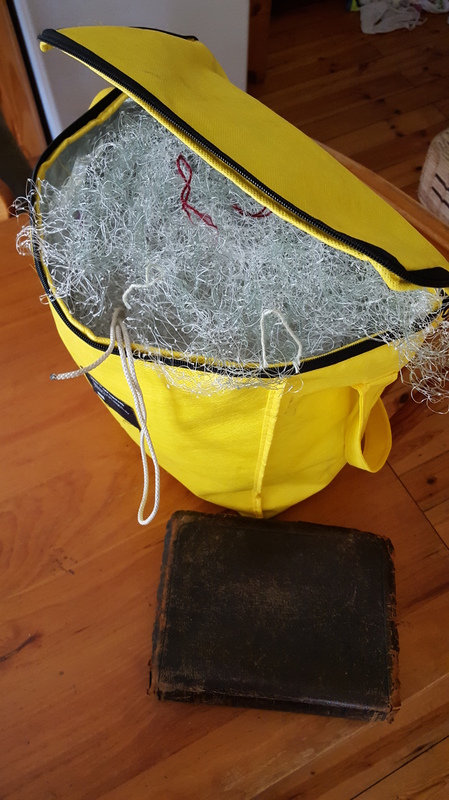 It contained the last fishing net my dad had been knitting, his watch and glasses and his Bible. I asked her whether there was anything in there that would get me stopped at airport security. She reassured me that there was nothing in there other than the net, glasses etc. As the bag went through the security x-ray, all the lights lit up and two security guards made a bee line for me. They grabbed the bag and asked me to open it. By this time I was laughing and crying and blaming my sister wholeheartedly! I thought it would serve her right if she had to return to the airport to post bail for me! The main security guard was so compassionate and caring when I explained the situation to her and even gave me a ‘God bless you’ when I left. We serve an awesome God who, even in the midst of deep sorrow, gives us the gift of laughter and love. 1 Response to SISTERLY REASSURANCE!! So true. He never completely abandon us in times of trouble.